In a small town in the middle of nowhere, a senior tradition called Panic rules the summer. Anyone is allowed to compete. Once you’re in, you must participate in the dangerous challenges whenever asked. People have died in the past, people have been paralyzed, but the cash prize for the winner means the game is as popular as ever. 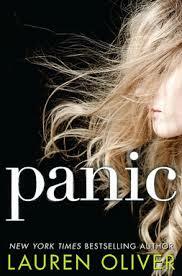 Heather seems an unlikely candidate, and her surprise entrance starts the story, which is fast-paced and action packed. This is the kind of story that fuels summer movies- not a lot of thinking but exciting and fun. Oliver is a good writer but nothing here is groundbreaking; kind of the definition of a summer read.